Dr Weinstein is very knowledgeable and easy to talk to. Please don't retire any time soon Dr. Weinstein. There aren't too many really good doctors like you left. Dr. Weinstein is personable and professional. Always a pleasant visit with Dr. Weinstein and his staff. I’ve been going to Dr. Weinstein since 1996 and his care has been exceptional since day one! He’s very knowledgeable and has a great bedside manner. The office staff is always very sweet too...an added bonus! best Dr. that I ever met. Very kind, gracious, and informative! Highly recommend! Dr Weinstein is a wonderful caring individual. And he is very thorough. Love his front desk person - a hoot! Dr Weinstein and his staff go out of their way to tailor healthcare to suit the specific needs of each client. 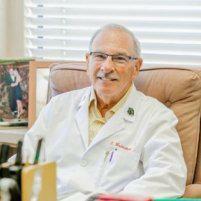 Dr. Weinstein is very knowledgeable, realistic, and transparent! Very thorough checking information from last visit. Doctor is always willing to spend time and answer any questions I have. I never feel hurried during my appointment. Dr. Weinstein is very nice and made me very comfortable! He really took time to listen to me and answer all of my concerns. I highly recommend!